My softneck garlic starting flopping over earlier in the week, so I knew it was time to harvest. Harvesting garlic is easy (just pull from the ground), but curing is an important step for long-term storage. After the garlic dries in a warm, dry space, it can be braided or tied for storage. I use the largest bulbs for replanting in the fall. Next week, I’ll probably harvest the hardneck garlic, which also appears to have done well this year. The garlic I stored last year lasted nearly a full year. Sure, it wasn’t in peak condition (some cloves were drying out or sprouting new plants), but we’ve been using it. With the new garlic just harvested, I decided to clear out the last of the old garlic. Instead of just throwing it out, I crushed the garlic, making a garlic olive oil. Update: A comment to this post raised concerns about botulism. I did a bit of research, and it is important to both add an acid to the mix and refrigerate. Also looking droopy were the Yukon Gold potato plants so I harvested them as well. 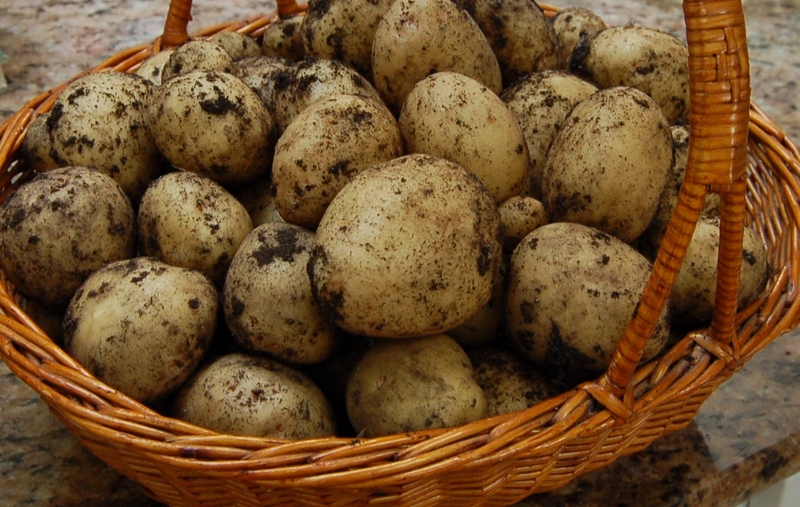 Not a bad haul from just nine seed potatoes! We’ll use some over the next few weeks for fresh eating and I’ll dice up, parboil, and freeze the rest for future soups and hash browns. Maybe someday we’ll have a root cellar for potato storage. Until then, I will continue my parboil and freeze method, using my trusy FoodSaver. I’ll leave you with a shot of an upcoming project. A neighbor down the street moved recently and asked us if we wanted his chickens (just 3) and their coop. We said sure. The coop is a beautiful shingled structure. Derek, my brother-in-law Jeff, and nephew Ryan spent all morning taking it apart to move it. Next week, they’ll reassemble it in its new home. It will be a thing of beauty and aside from the labor involved, it was free. Sweet! This entry was posted in Cooking & food preservation, Gardening, Livestock and tagged chicken coop, curing, garlic, harvesting, potatoes. Bookmark the permalink. I only tried garlic once and had zero luck. Any basic tips on location/soil. I think I should give it another go given the amount we go through. 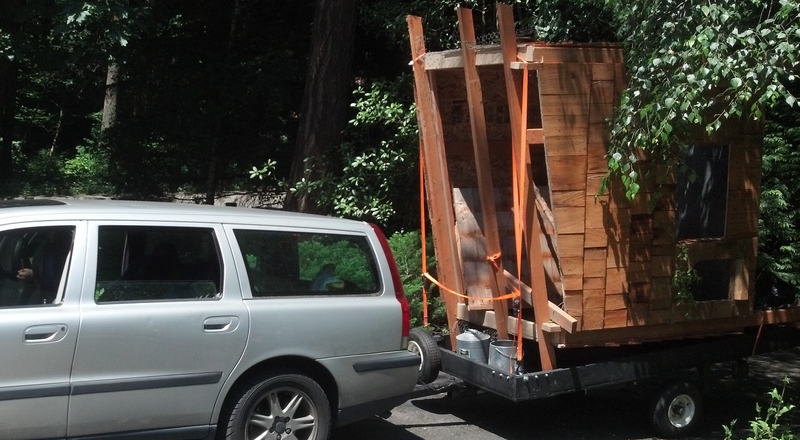 Thankfully, Milton (the neighbor) used a whole lot of screws to assemble the coop and henhouse. We were able to cleanly separate most of it and will re-assemble it (somewhere) in the orchard. Any bits that we can’t use – like extra 2x4s and 4x4s – we’ll try and salvage. The amount of actual waste for the dumpster will be pretty small. So I take it that used to be Milton’s hen house Hilton. Enjoy it when it’s back together again. Crushed garlic in olive oil sounds wonderful! I like your garlic oil idea. I have been wondering what to do with my left over garlic. What a great chicken coop………………..love the shingles, what generous neighbors !! I have always been leery to store garlic and olive oil for an extended period of time due to the risk of botulism… what’s your trick? oooh free chickens & coop, how fun! It likes like a pretty nice little coop, too. I’m working on plans for a new moveable hen house so I can expand my flock; tho it’s growing even now, with more ducks on the way. Lovely harvests! I mince lots of garlic and mix into butter, then keep it in jars in the fridge or freezer; nice to add to chicken or eggs! It must be garlic harvesting season in the northwest! I pulled all my garlic last weekend and it has been drying/curing in the shop. 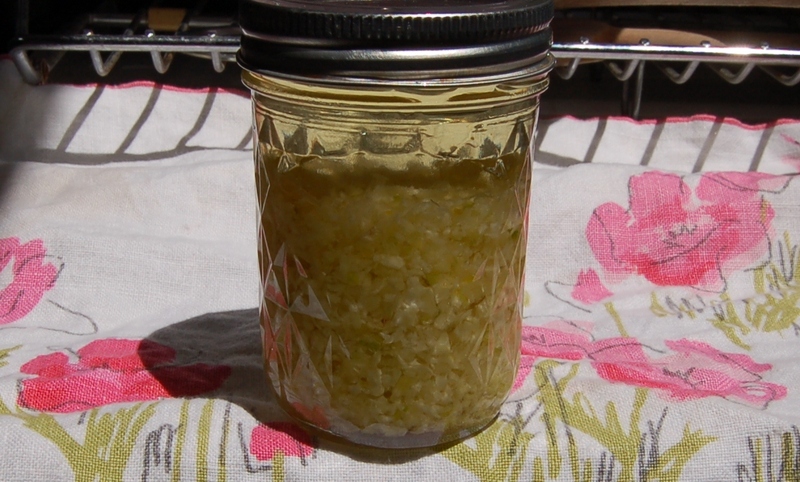 I checked on it today because I needed some garlic to make up a batch of refrigerator dills, and found that it is curing nicely but needs at least another week, possibly two. Looks like you had a nice harvest this year. Good (creative) use of the older garlic too. Lucky you getting that nice hen house and a couple of additional hens to add to your flock!